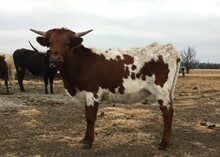 The horns are tall and tipping back on this big heifer. Had a beautiful heifer calf out of Hubbell's 20 Gauge on 2/2/17. Bred back to TCC Houdini for a early summer calf.